I had some pretty great meals during a recent trip to New York City, but the most satisfying had to be the chilled corn soup I ate at Bouchon Café. Let me tell you why. If you live on the East Coast, you no doubt experienced the Fourth of July heat wave (and if you lived in one of the states hit by the derecho, you may have been one of the poor souls that experienced it without air conditioning). Weather-wise, it was a brutal week, with mercury in the high 90s and 100s everyday. New York was a bit cooler than D.C., but still pretty hot. As Chris and I finished our morning shopping on Fifth Avenue, I decided Bouchon Café would be a good place to have lunch. It didn't seem that far away: we were at 53rd and Fifth, it's in the Time Warner Center at 59th and 8th. We could enjoy a nice walk across Central Park South to get there. Well, when it's that hot outside, even that distance midday is unpleasant. By the time we got to Bouchon, we were hot and spent. 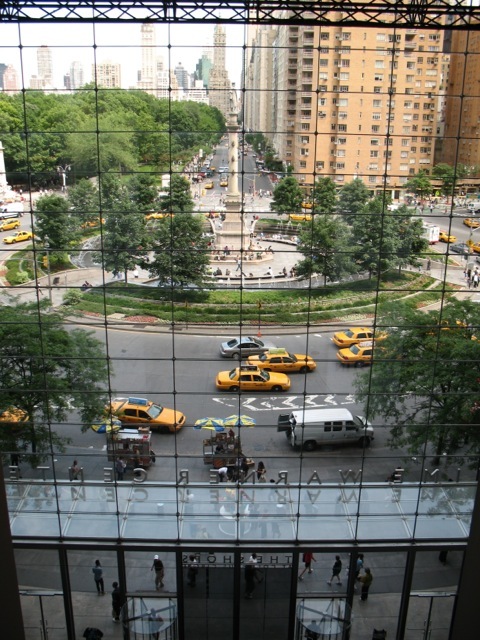 The Time Warner Center was the perfect choice to cool our heels: it's an indoor shopping center with a group of restaurants, including Per Se, the New York restaurant from Thomas Keller. Bouchon, the chef's casual restaurant chain, includes a few bakeries and this cafe, which serves soup and sandwiches on a terrace overlooking the mall's dramatic glass entrance (beyond which is a view of Columbus Circle and Central Park South). As we sat down, the server told us about the soup special: a chilled corn soup with a spicy tomato and pepper-infused oil. It sounded perfect and it was. It really hit the spot on that hot day. 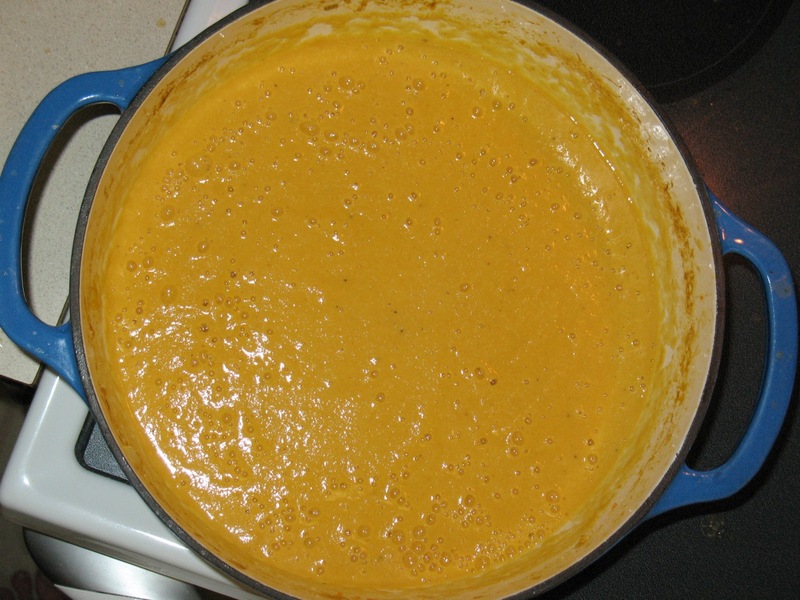 When I raved about it, the server told me it was a fairly simple recipe of onion, carrot, shallot, garlic and corn. I thought I could probably figure that out. I considered adding some sour cream to the pureed soup, but once I ran the immersion blender through it, the texture and flavor were so perfect that I decided it didn't need it. At Bouchon, the soup with served with a little chili pepper- and tomato-infused olive oil. I infused my oil using sundried tomatoes and red pepper flakes. This step is optional. The soup is good without it. You could garnish it with other things too, like chopped avocado, a drizzle of sour cream, cilantro, fresh chopped tomatoes, etc. Finally, although this recipe calls for chilling the soup, it's also good warm. 1. In a large soup pot or dutch oven, heat olive oil over medium heat. Add onion, carrots, shallots and garlic and sauté until vegetables are softened, about 10 minutes. Cut the corn kernels off the corn cobs and cut the cobs in half, reserving cobs. Add corn kernels to soup pot and stir to combine. Add vegetable broth, water and reserved corn cobs. Raise temperature to boil soup then reduce heat to low and simmer for 25 minutes. Allow soup to cool. 2. 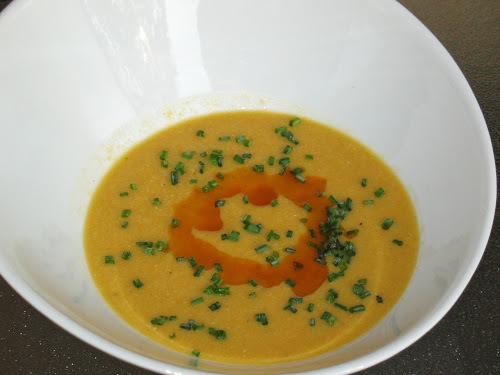 Use an immersion blender to puree the soup to a smooth consistency (alternatively, puree the soup in batches using a food processor). If chilling, transfer the soup to an appropriate container to chill in the refrigerator. 3. To make the tomato-chili oil, heat the olive oil over medium heat in a small frying pan or saucepan. Add the sundried tomatoes and chili pepper flakes. Once the oil begins to sizzle, turn the temperature to low and simmer a few minutes. Transfer the mixture to a heatproof container (a Pyrex glass measuring cup works well) and let it steep for 40 minutes. Strain the mixture. 4. Serve the soup warm or chilled with a sprinkle of fresh chives and a teaspoon of the infused oil. Reading this post brought back nice memories. I'm not sure what I'm more nostalgic for right now -- the corn soup we had in New York or the one you made at home. Both really hit the spot! You're welcome. I'm glad this soup was a hit.